When I heard that this memoir was written by a librarian who works at the Main Library in downtown Salt Lake City, I was instantly intrigued. Although that's not the library I regularly go to, I've been there several times for various events, and there's something about reading a book set in your own neck of the woods that just makes it that much more exciting (especially when you know it's being read on a national level). So when I saw a giveaway for this book on Entomology of a Bookworm (after being depressed by the long hold list at the library), I decided it couldn't hurt to enter. And then I saw that only a handful of people had entered (apparently other people weren't as intrigued by SLC librarians as I was), and I realized I might have a decent chance of winning it. Soon after entering, I was suggesting this book as a possible choice for our next book club. Realizing that the long hold list might make it difficult for people to read, I mentioned that I might WIN! a copy. That seemed like a lot to count on, but then, what do you know, I actually won it! That pretty much made my week, especially when it arrived in all its stiff, unblemished glory. 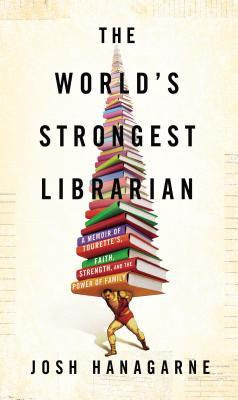 Josh Hanagarne is not your average librarian: he has Tourette Syndrome; he's 6'7"; he bends horseshoes on his lunch break; he can bench 350 lbs. ; he's a Mormon. Tell me that combination doesn't make you slightly interested. Anyone can write a memoir. I'm not being facetious; I really mean that. Everyone is living a life and therefore has something that, if pressed, he/she could write down. The catch is, not everyone has a life that other people want to read about. In the case of Josh Hanagarne, his story is worth reading not only because he has had remarkable success with subduing and controlling his Tourette's (memoir-worthy in and of itself), but also because he writes about faith, doubt, love, and endurance in a very real and honest way. Before I go any farther, might I coerce you to watch the book trailer? You might decide after watching it that you don't need to read the rest of this review; you just want to go read the book. That's what I thought when I saw it for the first time (except for the part about skipping this review, which was not an option). However, I found that some of the expectations I formed while watching the video went unfulfilled when I actually read the book. Writing a review of a memoir can be tricky because critical statements can be taken more personally: instead of just criticizing the plot or the writing style or the climax, it's like you're criticizing the actual person. I have no intention of doing that, but I do want to make a few broad and general statements that reflect my own impression of the book. Along similar lines, I was disappointed with all the crude humor and slang. This, even more than the foul language, felt gratuitous, probably because most of it came from Josh himself. And yet, it's a memoir, so I guess it doesn't necessarily make sense that he would clean up his language (although I haven't noticed the same kind of crudeness on his blog, so which one is the real Josh?). As I contemplated what I wanted to mention in this review, I debated whether I should even address any of my feelings about the religious aspect of this book. I am a member of The Church of Jesus Christ of Latter-day Saints (i.e., a Mormon), so maybe I can't offer a completely objective opinion, but I can at least add my opinions and thoughts to Josh Hanagarne's. Although Josh went on a mission and was married in the temple, he has struggled with the conviction of his faith for much of his life (at least, that's the impression I got from the book). I can definitely relate to some of his doubts. I think seeking for answers to those doubts is a natural way for us to extend our faith and strengthen our testimonies. However, I have to admit that as I read Josh's definitions and explanations of Mormon culture and doctrine, it felt foreign to me. His tone alternated between being flippant, cynical, and snide (along with a more reverent side I'll talk about in a minute). I was a little disturbed to realize that if this was my only exposure to Mormonism, I would probably not be interested in learning any more about it. For example, when he's talking about callings (assignments or jobs within a ward/congregation), he said, "Not everyone has a calling, because the decision to call someone rests on the answers that a church leader receives during prayer. So maybe you'd make a great teacher, but if you never flash into someone's head while he's trying to figure out the best person to fill that slot in Sunday school, your number might never come up." Maybe I'm being too sensitive, but his tone suggests that he's not convinced that callings are made in the right way, nor does he acknowledge that many of these callings are often discussed and prayed about by several people. But in all fairness, there were other times when he talked about some of his experiences in very reverent and respectful ways. For example, during his mission, he began to have more and more difficulty with his Tourette's, to the point that he was no longer able to do the work of a missionary. When he talked to the mission president about being released, he related, "He [the mission president] had the kindest eyes...'Oh, Josh. You've done enough. You served with honor and if you choose to leave now, you need to know that you served your entire mission. You did all you could and you did all that was asked of you.'" Anytime he spoke about his contact with church leaders, he only had positive things to say. These were my thoughts, but I understand that belief is something which is highly, highly personal. Josh tried to capture his own beliefs and relate them so that other people would be able to understand him and his relationship with his religion. It's not the way that I would write about Mormonism, but it's not my memoir. It's his. And I think he tried to be very honest in how he related his feelings. That's something that, even if I was a little disappointed in the content, I can still appreciate and respect. As I wrap up this review, I have to tell you that it's one of the hardest reviews I've ever written. I wrote and rewrote paragraphs and sat at the computer just thinking about this book and how I could best sum up my feelings. I felt like every sentence was a struggle...definitely not my favorite way to write. I think I had such a hard time, in part, because I didn't love the book, but at the same time, I did love the insight I gained by having an inside look at another person's life. There's something completely priceless about that. It would be a difficult book for me to recommend, but I still completely admire and respect Josh Hanagarne for his honesty and sincerity, for all the ways he has helped people with Tourette's, and for being willing to put himself in a vulnerable position by putting it all into a book. I have never heard of this book, but I totally get where you're coming from with wondering why people can be so flippant when talking about the church. That has really bothered me, especially on blogs, because I wonder what it makes other people think who aren't members. Still, this book does sound interesting -- and it's cool you won a giveaway! That's so neat you won the giveaway! Sounds like a very interesting read. I'm half way thru this as I "type" -- I have mixed feelings so far -- will come back and ready your review in FULL when I"m done...maybe we can compare notes. The language didn't bug me -- but yeah, surprised me some. When talking about the church, and maybe it was just me, but it was like he was relating someone else's church -- like, do I really belong to the same church as he does?? He made it sound like a charicature. But maybe that had something to do with his "not sure" state of being. But I totally relate to the struggle. I didn't include this in my review -- but probably should have -- but I thought it was disjointed (maybe that's why he called it weird) -- the chapters were a mishmash of library/tourette's/faith/bodybuilding -- just an odd editing decision. So, yeah, I did't love it...but I'm glad I read it. Yes, that's what I was trying to convey when I said that his descriptions of the Church felt foreign to me. Even though I could relate to some of his doubts and questions, I spent much of the book feeling like he wasn't talking about the same church I belong to. I agree that it was somewhat disjointed, but part of me loved the variety in each chapter...and I loved that he used the Dewey Decimal System to outline what each chapter was going to be about; I thought that was both creative and helped the disjointedness be a little more organized.